Vogue Doll Company's Forget-Me-Not modern Ginny Doll is from the 2001 Botanical Baby Collection representing various flowers. She is 8 inches tall. 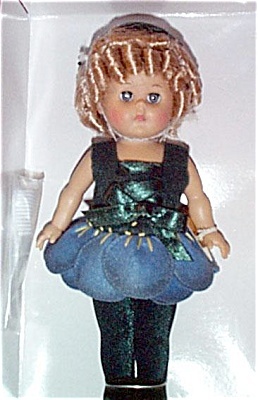 She has blue moving eyes and blonde ringlet curls with a green hair-bow. Her flower costume includes a green felt body suit with a skirt of blue petals, dark green tights, and dark green cloth slippers. She is adorable and looks very much like a forget-me-not. Retired, new and mint-in-the-box, with doll-sized comb and brush.